This is a picture I took of two people walking hand in hand and very much in love. Yes, it’s two women. So what? 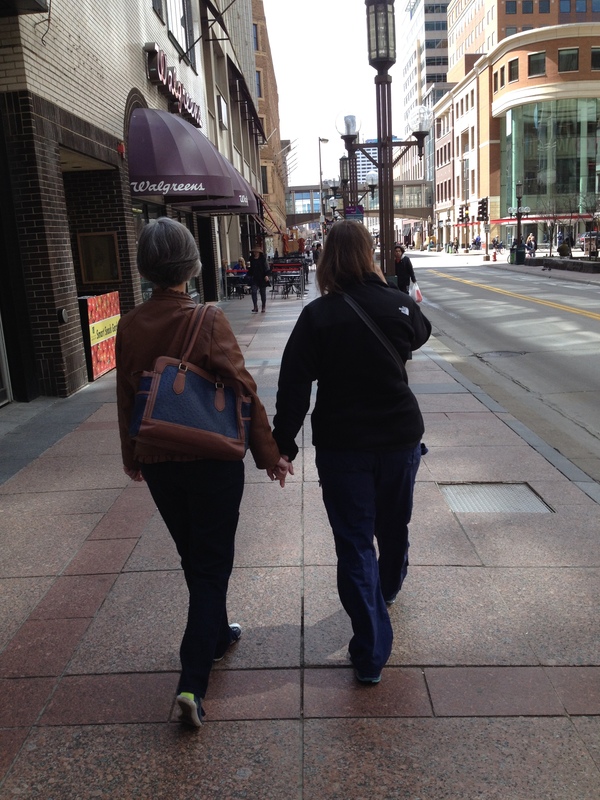 This is the first time in my life I have seen my aunt happy, in love and feeling free enough to walk down the street holding her lovers hand. What an amazing thing this is. Everyone one should have the right to be this happy. If you are in love, man and women, women and women, man and man, we all have the right to be happy and not be afraid to shout it out to the world. I am so happy for them! I have known my aunt my entire life (she is 10 years older than myself) and last week was the first time I have ever seen her this happy. This is one of those pictures that make me smile. I haven’t been here for a while which is really bad. Bad Amy, Bad! Slap on the wrist. I have been searching online on different ways to make money from home. You see, I went a little overboard last Christmas and my regulare job, well, my at home on the phone job, hours are becoming harder to find. So, I have been searching every lead, trying a variety of different things. Some are working out, but the money is very low and it takes a very long time to make anything. Here is a list of some of the ones that seem to be working. Chatabout is my favorite. You earn points just for chatting. It’s easy, it’s fun and I love it. I am almost up to my $50 payout but it’s taken me two months to get here. But you can get a variety of things, gift cards and small trinkets. Amazon Mechanical Turk is excellent for taking surveys. There are hundreds of surveys and they tell you what they are looking for if they are looking for something special. They don’t pay that great, however you have a lot of choices, you won’t get rejected or get the message “you don’t qualify”. Bubblews is great, it’s just a blogging sight that you get paid in cash for points and you get points from each like and comment you receive on your posts. Postloops is another great one but it’s hard to find forums to comment on that match your interest. Those are some of my favorites and I do at least a little each day. Swagbucks is a popular one however I haven’t quite figured it out yet, but still working on it. 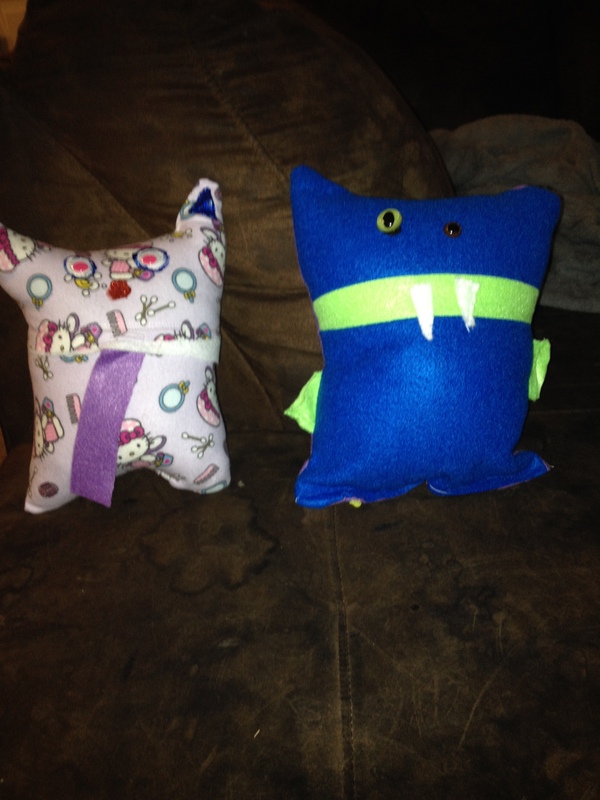 Anyway, there are these little creatures that I have been working on also, my kids just seem to love them. They are simple to make and fun and the kids can help out with them. This is a picture of my two favorite ones. I just finished them today and they are ready and waiting for when the kids get home. I hope you like them! For the first mission, they send me much more than what I was expecting actually and I do highly recommend it. This is Sam. Two days ago she was telling me how sad she was because she wasn’t pretty enough. Well, I have been talking to her and we went on a long walk through the forest and we talked. She had never been in the forest before and it made her so happy! She forgot all about trying to be someone she isn’t and found something that makes her happy, NATURE! She found a leaf with a lady bug on it and an acorn. They are her treasures and she loves them so much! She just doesn’t care about trying look like a girl, just call her Sam. She loves to be outside all the time looking for new treasures. She will be on Etsy within a few minutes.